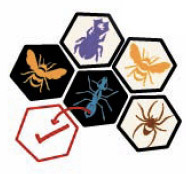 The pieces surrounding the Queen Bee can be made up of a mixture of both your pieces and your opponent's. The first player to surround their opponent's Queen Bee wins. 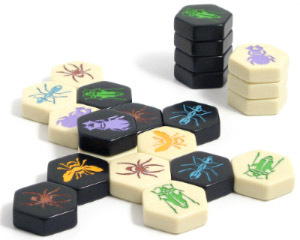 The pieces in play define the playing surface, known as the Hive. Play begings with one player placing a piece from their hand in the centre of the table and the next player joining one of their own pieces to it edge to edge. Players then take turns to either place or move any one of their pieces. A new piece can be introduced into the game at any time. However, with the exception of the first piece placed by each player, pieces may not be placed next to a piece of the opponent's color. It is possible to win the game without placing all your pieces but once a piece has been placed it can't be removed. Your Queen Bee can be placed at any time from your first to your fourth turn. You must place your Queen Bee on your fourth turn if you have not placed it before. Once your Queen Bee has been placed (but not before), you can decide whether to use each turn after that to place another tile or to move one of the pieces that have already been placed. 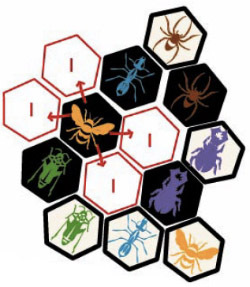 Each creature has its own way of moving about the Hive and it's possible to move pieces to a position where they touch one or more of your opponent's tiles. Note: All pieces must always touch at least one other piece. If a piece the only connection between two parts of the Hive, it may not be moved. The Queen Bee can move only one space per turn. Even thought it is restricted in this way, if moved at the right time it can severely disrupt your opponent's plans. 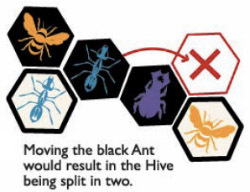 From this position, the black Queen Bee is able to move into one of four spaces. The Beetle, like the Queen Bee, moves only one space per turn. Unlike any other creature though, it can also move on top of the Hive. A piece with a beetle on top of it is unable to move and for the purposes of the placing rules, the stack takes on the color of the Beetle. 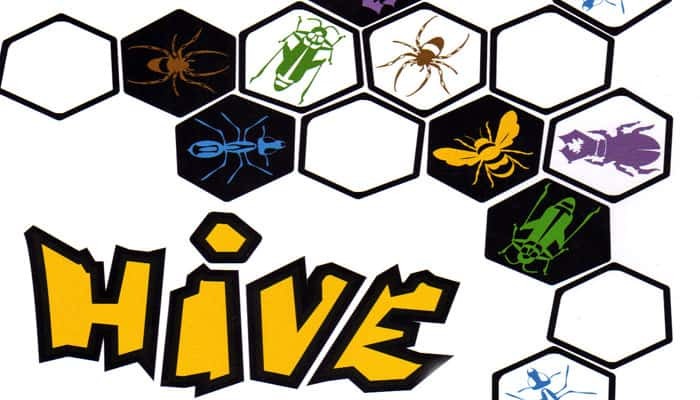 From its position on top of the Hive, the Beetle can move from tile to tile across the top of the Hive. 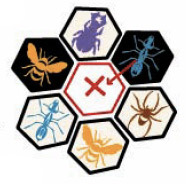 It can also drop into spaces that are surrounded and therefore not accessible to most other creatures. From its position, the white Beetle is able to move into one of four positions. The only way to block a Beetle that is on top of the Hive is to move another Beetle on top of it. All four Beetles can be stacked on top of each other. Note: When it is first placed, the Beetle is placed in the same way as all other pieces. It can't be placed directly on top of the Hive, even though it can be moved there later. 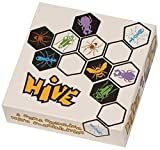 The Grasshopper does not move around the outside of the Hive like the other creatures. Instead, it jumps from its space over any number of pieces (but at least one) to the next unoccupied space along a straight row of joined pieces. This gives it the advantage of being able to fill in a space which is surrounded by other tiles. From its position, the white Grasshopper can jump to one of three spaces. Note: It can't jump across the gap to the space marked x. The Spider moves three spaces per turn - no more, no less. It must move in a direct path and can't backtrack on itself. It may only move around pieces that it is in direct contact with on each step of its move and it may not move across to a piece that it's not in direct contact with. 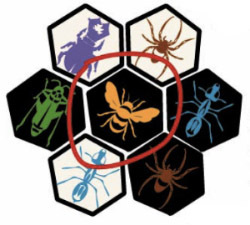 From its position, the black Spider can move into one of four spaces but is unable to move to the position on its left marked 2 on its first step. The Soldier Ant can move from its position to any other position around the Hive provided the restrictions are adhered to. This freedom of movement makes the Ant one of the most valuable pieces. 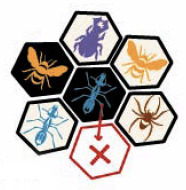 In this case, the Ant can be move into one of eleven positions but is unable to move into the position in the centre of the Hive. The pieces in play must be linked at all times. At no time can you leave a piece stranded (not joined to the Hive) or seperate the Hive in two. 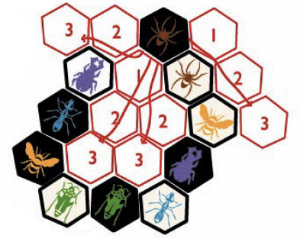 Use this rule to your advantage by moving your pieces to strategic positions around the Hive, leaving your opponent's key pieces unable to move. 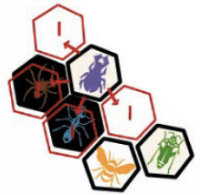 Moving the black Queen Bee to a position where it re-links the Hive is also an illegal move as the Hive is left unlinked while the piece is in transit. The creatures can only move in a sliding movement. If a piece is surrounded to the point that it can no longer physically slide out of its position, it may not be moved. 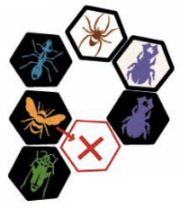 The only exceptions are the Grasshopper, which can jump into or out of a space, and the Beetle, which can also climb up or down. Similarly, no piece may move into a space that it can't physically slide into. Note: When first introduced to the game, a piece may be placed into a space that is surrounded as long as it does not violate any of the placing rules, in particular the rule about pieces not being allowed to touch pieces of the other color when they are first placed. If a player can nether place a new piece or move an existing piece, the turn passes to their opponent who then takes their turn again. 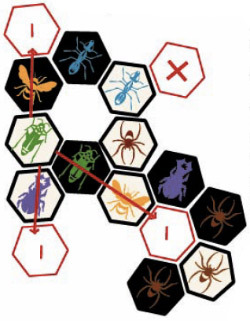 The game continues in this way until the player is able to move or place one of their pieces, or until the game is lost iwth the surrounding of their Queen Bee. The game ends as soon as one Queen Bee is completely surrounded by pieces of any color. 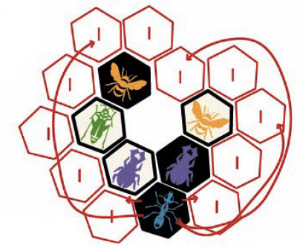 The person whose Queen Bee is surrounded loses the game, unless the last piece to surround their Queen Bee also completes the surround of the other Queen Bee. In that case the game is drawn. A draw may also be agreed if both players are in a position where they are forced to move the same two pieces over and over again, without any possibility of the stalemate being resolved.